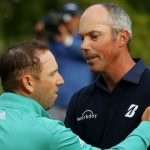 Matt Kuchar has been front and centre lately for the squabble between himself and David Ortiz, the fill-in caddie he used when he won the Mayakoba Classic back in November. 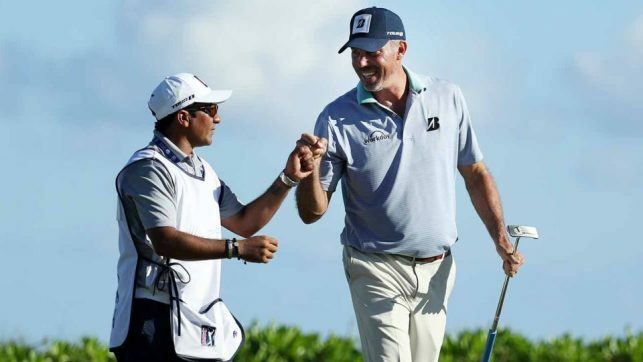 Kuchar paid Ortiz $5,000 from his winnings of $1.296 million but Ortiz thought he deserved more. Kuchar’s agent Mark Steinberg, who also reps Tiger Woods, stepped into it by ham-handedly offering an additional $15,000 but Ortiz felt he was owed $50,000. Kuchar eventually paid $50,000 after the story became big news. Then Kooch went on TV with a mea culpa to try to salvage his reputation. Is Kuchar out of the woods on this one or will it permanently tarnish his nice guy image? Jim Deeks, Fairways Magazine (@jimdeeks): I’d say he’s out of the woods, but he lost his pants in there. I don’t know who Mark Steinberg uses to advise his clients on crisis management, but my 4-year-old grandson could’ve done a better job. First, Kuchar stiffs the guy with a measly $5K. Then later, when questioned about it, says “hey, I gave him an extra grand than we’d agreed upon at the start of the week. Besides $5K is a nice wad of cash [for a poor paisano who usually makes $200 a week]” — about as dumb, condescending and insulting a statement as anyone could possibly utter. Then the agent throws $15K at the caddy, basically in an effort to shut him up. Then, finally, Kooch sees the light… or rather, the 100,000-watt spotlight shining on him… calls himself stupid, and says, “Oh David, old buddy, old pal, here’s your $50K. Are we done?” Bottom line, yes, the poor caddy got $50K, but that’s still more than 50% LESS than the “accepted rate” for tournament wins. Kooch is a nice guy, and we all like him, but it’ll be years before he lives this character-revealing, goal-line fumble down. And rightfully so. Craig Loughry, Golf Ontario (@craigloughry): I’m not going to judge Kuchar on this incident alone. He handled it poorly, admitted his mistake, and is trying to make things right. But please keep in mind this is a local caddie. He doesn’t have travel expenses like other Tour caddies (he’s not flying across the country or the world, parking his life 30+ weeks a year away from a family). Comparing Ortiz to a professional Tour caddie is like comparing a good local Amateur player to a Professional golfer. He did a fine job, that I’m certain of, and Ortiz deserved more than the original payment, but to think or expect the same compensation as a Tour caddie is ridiculous. You’re still alright in my books Kooch, but if you didn’t try and make it right, you’d hear from me and a million others, so good on you for admitting it and changing the compensation. Michael Schurman, Master Professional / Life Member, PGA of Canada: Kuchar really fumbled the ball on this one. Even though a caddy is a private contractor the PGA Tour has various benefit packages in place to protect them/help them. Perhaps it’s time to have a basic contract that caddies have to sign before they ‘carry’ for someone. In fact, I wonder what the legalities of a player having a family member caddy for them. How is the issue of liability covered? Or, injury to the caddy while in the workplace. If there were to be such an agreement it would have to include a section for exceptions like existed in the case of a player like Tiger who has a massively increased list of responsibilities and exposures. And, what do you do when a caddy is injured and replaced by a fan? It has yet to occur but when the PGA TOUR is involved in such incredible amounts of money there will come a time when an incident involving a caddy creates a huge lawsuit. It would be best to be prepared. 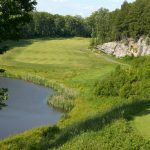 Dave Kaplan, Freelance Writer (@davykap): I really hope that it does not tarnish his reputation because he truly is one of the nicer guys on the PGA Tour, but people have eerily-long memories when it comes to negative publicity and any articles written about the debacle will remain digitized forever. Unfortunately, that’s just how the Internet works. It’s the reason why Sergio Garcia is still known just as much for winning a major as he is for spitting into a cup in 2007 or making that fried chicken comment about Tiger in 2013. 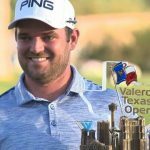 TJ Rule, Golf Away Tours (@GolfAwayTJ): This falls into the category of “will be soon forgotten” however it could have been even less of a story and blip on his reputation if he had just done the right thing from the start, or when the story first came out. It seemed strange that he took so long to do what was right, even if being “right” is only in the public’s eye. But in the end, this story won’t have much of an impact on his overall career and reputation. These stories fade into oblivion sooner or later. Hal Quinn, Freelance Writer, Vancouver: Before submitting to the unanimous decision in the court of public opinion – and after hearing chants of “Mooch” harmonizing with the ubiquitous “Kooch” – Kuchar took just long enough to strip in public and reveal his naked character and personality. His ‘golly gee’ facade is well and truly shattered not simply tarnished. Peter Mumford, Fairways Magazine (@FairwaysMag): If there’s anybody more tone-deaf than a professional athlete living in a protected bubble, its an agent for a professional athlete. Mark Steinberg showed his true colours in trying to cover for Tiger Woods on numerous occasions, so it should come as no surprise that he made the Matt Kuchar – David Ortiz situation worse. The deal Kuchar made with his caddie was a pretty good one for Ortiz. If Kuch had finished 60th and pocketed $12,000, giving the caddie the agreed upon $4,000 plus a $1,000 bonus was more than OK. The two of them should have included a “what if you win” clause. Kuchar messed up big time and compounded the problem with his weaselly explanation. This will and should have some lasting tarnish, except if he runs for higher office on the Republican ticket, where not paying his bills, sleazy rationalizations to the press and suppressing Mexicans are all considered positive attributes. 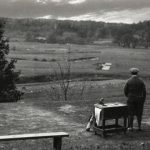 The recent changes to the Rules of Golf included a “ready golf” provision that seems to have been left out of the version received by PGA Tour players. On Sunday at Riviera, human rain delay J.B. Holmes plodded his way to victory but no telling what his ponderous pace did to Justin Thomas, who is quick and even Adam Scott, who can be slow himself on occasion. 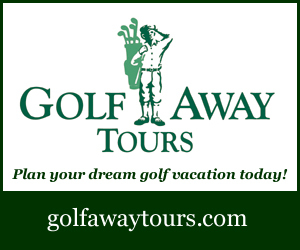 The Tour has a Rule that covers slow play and includes stroke penalties for multiple infractions, but as we all know, it is NEVER enforced. Many players want the strokes assessed. Scott even said to call it on him – just to get things started. 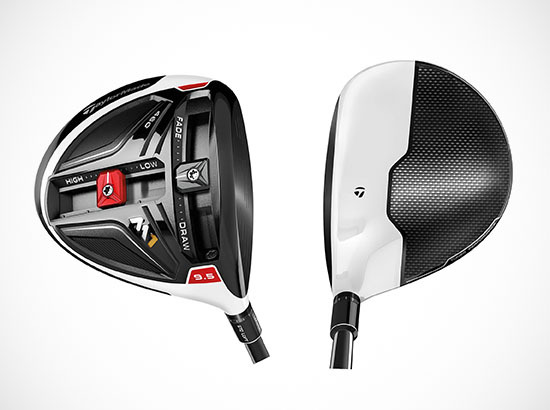 Do you think we’ll ever see the Tour start assessing strokes for slow play? Deeks: Yes, I believe the Tour will get right on this… on Thursday rounds on the Latin American Tour, and only on guys who are 8-over par. In reality, I’m sure the Tour is actively trying to encourage guys to speed it up, voluntarily, so they don’t have to enforce anything. Enforcement will be controversial, will undoubtedly be fraught with “legalese” (i.e., hearings and appeals), and very hard to prove the infraction in the first place. Probably the only way to make it valid, and consistent, is to have shot clocks on every player, with the clock starting the split second the previous player strikes his ball. The “away” player then gets :30 seconds to strike his own ball, or 1:00 if he’s in a hazard. Great idea, but ain’t never gon’ happen. So, don’t hold your breath, you may expire. Loughry: I don’t think the PGA Tour Rules Officials will start calling stroke play penalties. BUT THEY SHOULD. There’s too much conflict, the Officials are Tour employees, the Players makeup the Tour, so technically you would be penalizing one of your bosses. Until TV or sponsors or both force the hand of the Tour by penalizing them on TV time/contract commitments this will not change sadly. Which, by the way, is HORRIBLE for the game. Watching that last group was painful, at one point I believe they were at least two full holes behind, only to catch up and make the deficit a hole and a half. Honestly, that’s pathetic, and I don’t care how difficult the conditions were, there is no excuse to be that far behind the group ahead of you, that is also managing those same conditions much faster than your group (sorry JB). I applaud the European Tour for addressing the issue and taking it more seriously. Schurman: People claim they don’t play golf because of slow play. It isn’t new! Before golf was broadcast on TV guys like Dr. Cary Middlecoff were renowned for it. But once TV took hold and people could see the best players nobody taught the masses how to play slow better than Jack Nicklaus. One of the reasons slow play can exist is good old-fashioned money. When a tournament ‘runs’ past its allotted time the sponsors get added opportunity to advertise and the PGA TOUR collects their share of that revenue. The rule of “no harm no foul” is prevalent and since the people who benefit the most are in charge, nothing will change. Kaplan: The Tour had better if it wants the sport’s popularity to grow or even stay where it’s at going forward. Slow play is a scourge and needs to be rooted out of the game at both the professional and amateur levels. Because at the end of the day if the pros aren’t being dinged for their sloth-like play, then why should Joe or Jill Hacker, who take 5+ hours to play 6,000-yard courses and hover over every putt as if a Green Jacket were on the line, feel the need to speed up their games? Rule: From what I understand in the new Rules of Golf (and I never pretend to be a rules expert! ), the pace of play “rule” is actually just a recommendation, and ready golf in stroke play is “encouraged”. I know there are rules around pace of play as it relates to your positioning on the golf course, but the PGA Tour has very rarely assessed any penalties in the past, and that’s sad. I think that pace of play is a huge issue with the game, something they can hide when there are dozens of players’ shots, and dozens of announcer’s soliloquies they can show in a broadcast. Bring Keith Pelley to the PGA Tour soon! Quinn: Scott also said that until TV and the Tour sponsors demand it, the Tour won’t do anything about slow play. How’d Arnie’s “While we’re Young” campaign work out? One way TV could get the Tour’s attention – big money is involved for TV as over-run coverage and Monday extensions cost make-good dollars to all ‘previously scheduled’ programs — is to just leave the camera on a turtle like Holmes. Instead of cutting away to a guy putting for 10th place money, just leave it on Holmes with a clock running in the bottom left of the screen. The resulting social media tsunami will force the Tour to finally and fully appreciate the problem and maybe, just maybe, do something. It has to come down to money (and audience) losses for TV to have TV get the Tour to act. Mumford: I believe we’ll see penalty strokes for slow play soon. 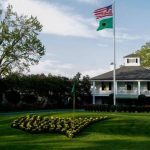 The PGA Tour would never move on this without the approval of the members but now player moans are turning to shouts – especially when a player’s performance is affected by the slow play of another. All it will take to get everybody moving faster will be a couple of well-timed penalties that cost someone a win or big cheque. The technology is available now to time every player on every shot, the Rules are in place – they just need the will to proceed. Like most changes, it will likely start on the developmental tours, but by next season, I expect someone on the PGA Tour to actually get a slow play penalty – probably not on Sunday though. Sam Snead, Jack Nicklaus and Tiger Woods own a large chunk of the record book when it comes to the PGA Tour but not all of them. (A) what’s your favourite record and (B) the one least likely to ever be broken. 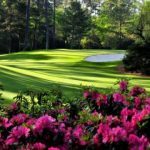 Deeks: One of my “favourite” records is the highest-ever score on No.12 at the Masters — 13, by Tom Weiskopf in 1980, which included five previously dry golf balls. Couldn’t have happened to a better guy. I think the record least likely to ever be broken is Byron Nelson’s 11 wins in a row in 1945. Yes, people question the depth of the competition, with quite a few big names still not back from the War, but I don’t really care: Byron shot the lowest score each weekend. Tiger’s had 7 in a row, Hogan had 6, but I just don’t see anyone ever dominating for nearly three straight months ever again! 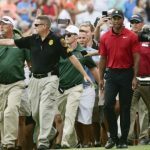 Loughry: Tiger Woods consecutive cuts made. INSANE at 142. He went, are you ready for it, he went SEVEN YEARS without missing a cut. Nobody even close to that currently or historically. I don’t think this one will ever be broken. To me it shows how incredible a talent he was in his prime and completely DOMINANT. Other statistical records I’m interested in, most PGA Tour wins, and “Professional” Majors count (although I did like it when the US and British Amateurs counted as Majors too). Schurman: I love these debates in spite of the inevitable comparison to records set long ago to today’s stats! 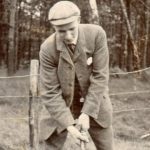 One of the earliest records set is by Young Tom Morris who won 4 consecutive British Opens. That’s a nearly impossible feat today! Or, Bob Jones standard of 9 victories and 4-second place finishes in 16 US Opens and US Ams held from 1923 to 1930 or 81%. Also, his lifetime record in the major championships is 27 top 10s of 31 events. In the 1930s and 40s you have a guy who might not have set records but his accomplishments are insane! The diminutive Paul Runyan at 5′ 4″ and 108 lbs who was the shortest driver to play on the PGA tour often giving up 20 to 25% (today that would equal a 250 yd drive to 310 to 320 by the bombers) won 29 times. He claimed on chip shots around the green he averaged 1.97 strokes. Meaning he chipped ‘in’ slightly more than he chipped and 2-putted. No records but incredible! Then Byron Nelson with 18 victories in a season and 65 consecutive top 10s. And, then we come to the more modern era when the fields became deeper and stronger and Nicklaus with 18 major wins. He also had 17 consecutive top 10 finishes in the money on the PGA TOUR. Last, is Tiger Woods 142 consecutive cuts. So, what is the greatest of them all; my favourite; the one that will never be broken? It’s a tie! Byron’s 11 consecutive victories and Nicklaus 37 top two finishes in the majors. Kaplan: You can really restructure this question to read “Which of Tiger Woods’s records are your favourite and the least likely to be broken” because he has just been that dominant over the course of his career. Anyway, the least likely record to ever be broken is Tiger’s 18 WGC victories. Second on that list is Dustin Johnson with 5. . . so good luck with that one fellas! My favourite golf record, which will also never be broken, is Tiger’s 46 PGA Tour victories over the course of his 20s. Jack Nicklaus, who many consider to be the greatest golfer ever, is the next closest challenger with 30 wins in his 20s—less than 2/3 the amount of PGA Tour victories that Tiger racked up over that 10-year period! Rule: I once heard a stat that Tiger Woods went the entire 2005 season without missing a putt inside 5 feet. That’s 485 putts, and although some of those were tap ins, that’s still an unbelievable record. Not all 4-5 footers are straight or easy to read, so to go that many in a row without missing one is remarkable, that’s my favourite stat. As for the record least likely to be broken, that’s an easy one for me, it’s Byron Nelson’s record of 11 consecutive victories in 1945, ending with the Canadian Open at Thornhill G&CC, and his total 18 victories that year is a record that is equally as un-breakable! Quinn: The one that has always made me shake my head is Jack’s 19 seconds in the Majors. Everyone, especially Eldrick, focusses on the 18 Major wins, but being runner up that many times is almost as amazing. Playing that great in 37 Majors is incredible. That’s why my favourite is Jack’s 19 and why that’s also the one that won’t be broken. 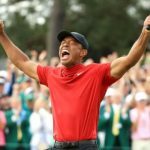 Mumford: Tiger’s streak of making the cut in 142 consecutive events, and the record for consecutive seasons with at least one PGA Tour victory, which is held by Jack Nicklaus and Arnold Palmer at 17, both speak to a level of consistency and excellence that set the record holders above the rest of the field. Nobody has or ever will come close to breaking Tigers’ cut streak, but Dustin Johnson might catch and pass Nicklaus and Palmer, albeit with an asterisk. 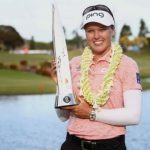 Initially, the record was for most consecutive years with a win but when the Tour added its wrap-around season, it became most consecutive seasons. Good thing for DJ. He actually didn’t win a tournament in the calendar year 2014 but his win at the WGC-HSBC Champions in November 2013 counted towards the 2013-14 season and kept his consecutive seasons streak alive. It now stands at 11. Johnson is still only 34 and could eventually set a new standard for consistency.